Arrive Jodhpur. depart for local sightseeing of Jodhpur visiting, Mehrangarh fort, Jaswant Thada & Umaid Bhawan Palace. Evening drop at railway station Train at 18:00 Pm. Reach Jaisalmer at 23:25Pm . Pick Up from Railay station drop at Hotel Overnight at the hotel. After Breakfast you depart for Jaisalmer local sightseeing . 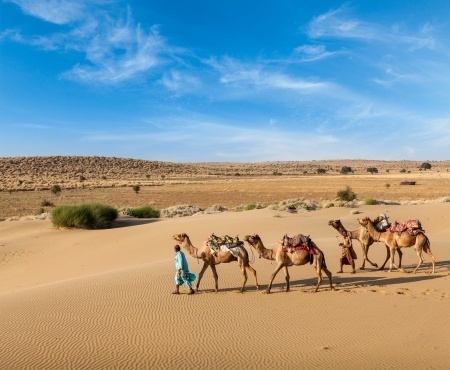 Afternoon you will proceed to Sam village to witness the spectacular sunset on the Thar Desert. You can also enjoy a camel ride on the sand dunes. Overnight at the hotel. Morning you will proceed for a half day sight seeing tour if Jaisalmer visiting Gandisar Lake, Jaisalmer Fort and Patwon Ki Haveli.Overnight at the hotel. Early Morning Transfer to Railway Station Train for Jodhpur at 07:00 Am.